Travelling between Singapore and Indonesia has proven to be very accessible these days when you have amazing ferry operators providing great services to visit these two countries. 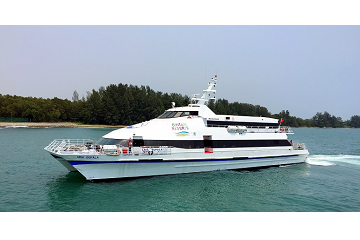 One of the most accomplished transportation companies Bintan Resort Ferries have been servicing Singapore to Bintan Island in Indonesia since they were established since 1994. Now that Easybook is available for your convenience, you can be anywhere in the world to book your tickets online for the ferries on our platforms within minutes through a few simple steps. You can count on the largest land and sea transport booking website in Southeast Asia to help make your trips smoother. 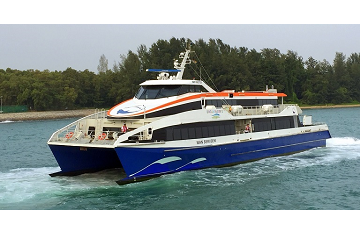 Bintan Resort Ferry went from starting its operation at World Trade Centre, which is now known as Harbour Front before shifting over to Tanah Merah Ferry Terminal in 1995 have been a key operator for many sea transportation needs over the years. Bintan Resort Ferry travels between Bandar Bentan Telani (BBT) in Bintan Island, Indonesia to Tanah Merah Ferry Terminal in Singapore with return rides as well. It takes approximately one hour for the ferries ride to arrive at your destination and you are advised to check-in at the counter at least 90 minutes before departure time. 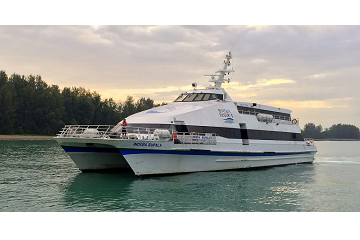 You can expect to ride with four catamaran ferries by the company with one 262-seater Aria Bupala and one 286-seater Indera Bupala when Bintan Resort Ferries started their business. Then they added two new 42-meter ferries of Wan Seri Beni and Wan Sendari in 2009. 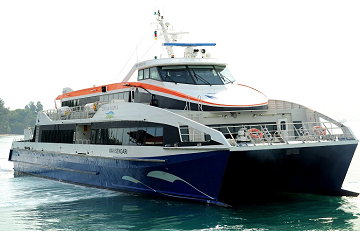 The new Bintan Resort Ferry fleet were built from Netherlands, so you can expect high technology and great engineering systems that come with 300 seats for the convenience of travellers. This ferry company will always ensure you have a safe and comfortable ride when travelling with the reliable Bintan Resort Ferries. They are constantly improving their services to allow you to get more flexible schedules and promotions for a better ferry experience. Below are the departure and arrival times that Bintan Resort Ferries offer which take about one hour per trip depending on the weather, as well as sea condition. Take into consideration that there is a one-hour time difference between Singapore and Indonesia, as well as the times noted are in local time. To ensure you have a smooth travel, give your hotel in Bintan Island a call to find out if they offer pick-up services from the ferry terminals to make it even more convenient. When riding with Bintan Resort Ferries, the choices of places to go and do are endless. Whether you are going heading into Singapore or Bintan Island, you are guaranteed to go back with a full bag of great memories upon booking you ferry ticket online with Easybook! Below are some suggestions for both places you can explore the next time you are heading that way. Let us start with Bintan Island in Indonesia. Take it easy as you kayak through the beautiful clear water of Crystal Lagoon at Treasure Bay as you soak in the view and experience. Do something extreme when you visit Treasure Bay in the Lagoi region by jumping on the exciting quads or more known as ATV bikes to drive through some great challenges. One of the many things you can do at the wonderful Bintan Lagoon Resort is archery over a beautiful backdrop in the evening and pick up a new skill while you are at it too. Over in Singapore, you can check out the country’s first indoor batting cage at Homerun Baseball to hit some shots or you can also choose to be in the pitching lane to keep active. Keep the energy going at G-Max by Clarke Quay where you are able to try out reverse bungee ride and other exciting rides to keep your adrenaline rushing. Take it easy as you sit back on the comfortable sofas and enjoy some classic films at boutique theatre of Screening Room where you get to feast and drink while you watch a great indie film that takes place twice a day. Whether you are heading to Indonesia’s Bintan Island to get Instagram-worthy images at Gurun Pasir Bintan & Telaga Biru or known as Bintan Desert or spend a day at the amazing amusement park of Universal Studios in Singapore, Bintan Resort Ferries is ready to take you there. The Bintan Resort ferries have allowed travelers between the two neighboring countries to commute easily whether it is for work or pleasure. Once you have purchased your tickets online on Easybook website or mobile app that you can download to your devices so you can book them no matter where or when. We look forward to kick starting your next trip!